Choosing the right appliances for your kitchen to function efficiently can be quite confusing when trying to find the best ones for you. Once you have decided on the design element of your kitchen, you will then need to consider how you would like your kitchen to function by choosing the appliances perfect for your needs and space. With frequent use, the hob is an important piece of kitchen equipment. Hobs function quite similar to conventional cook tops except that they are built-in. Since it is fixed, the cooking space is firm and sturdy unlike a cook top. The surface design makes cleaning easy and simple. Built-in hobs are usually 60cm wide and traditionally have four burners. 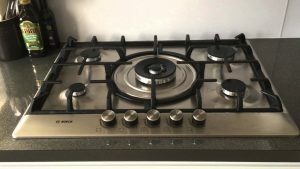 The dimensions for the gap into which a hob fits will be smaller than the hob itself, as the hob overlaps and stands proud on the work surface. You’ll also see plenty of larger 70cm widths available with extra burners that can still fit into a 60cm cut-out by overlapping the work surface. If you have the space, there are 80cm and 90cm models available, too. There are four different types of hobs. Each with different functions and features depending on what suits you and the way you like to cook. 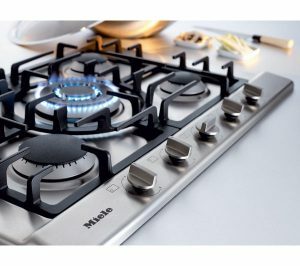 The Induction hobs, which use a magnetic field to create heat between the pan and hob, are known to be energy efficient, quick, and considered a cleaner choice. Child-safety controls Touch controls that can be locked to prevent children altering settings or switching on the hob. Fish kettle/casserole zone Elongated cooking zone that can accommodate a fish kettle or long casserole dish. Range of heat outputs Low to maintain a good simmer and high for quick heating/ stir-frying etc. Removable controls For easy cleaning. Ultra rapid burners For bringing water to the boil or frying food in a wok. Automatic ignition will spark gas alight when controls are turned and pushed in. Coated pan supports Much easier to clean than bare stainless steel. Flame failure protection If the burner goes out accidentally, flame will re-light automatically or gas stops running. Overspill protection Detects when liquid has boiled over and turns the power off. Removable pan supports Can be taken apart and washed. Consider weight and robustness.